Sometimes, amazing stories don't always have happy endings. A 3-foot-long alligator who was found wandering the streets of New York City has unfortunately passed away, just hours after he was rescued. The alligator was taking a leisurely stroll down Ninth Avenue in Inwood when he was picked up byAnimal Care Centers of NYC (ACC), who gave him the nickname CockadoodleQ. They had intended to eventually release him back into his natural habitat in the wild, but sadly, the mysterious visitor passed away only 12 hours later. A spokesperson for the ACC told The New York Times that the cause of death had not been not yet been determined. 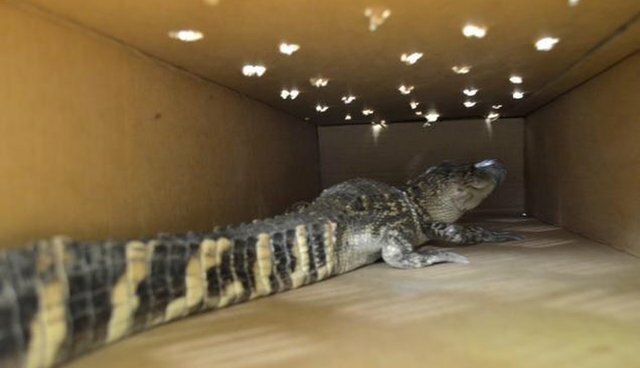 It's illegal to have exotic animals as pets in New York City - and that includes alligators. It's likely that this poor little guy was abandoned by his owner after he got too big to be kept indoors. People took to Twitter on Saturday to show their condolences for CockadoodleQ, who had become a mini celebrity in his short time in New York City. To read more about the exotic pet trade and why it's cruel to animals, go here.